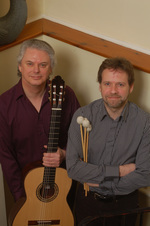 The Isis Duo comprising Raymond Burley and Keith Fairbairn is currently exploring the repertory of music for guitar and tuned percussion. 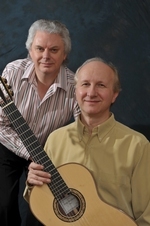 The duo's programme features both original and arranged works by Bartok, Celso Machado, Piazzolla, Poulenc, Steve Reich, Rózsa, Falla and Paulo Bellinati. Keith Fairbairn's career has involved a wide variety of musical situations; his first professional engagements - in the fields of both classical and the avante garde - were with major London orchestras and chamber ensembles such as the London Sinfonietta and London Symphony Orchestra. From early in his career Keith became involved in studio work and was soon one of the very few 'first call' percussionists on the London session scene. In this capacity he has played on numerous TV shows, recordings and films, and was hired for for major tours. Some of the artists, conductors and composers to call on Keith's expertise include Mike Oldfield, Dionne Warwick, John Williams, Madonna, John Dankworth, Oliver Knussen, Richard Blackford, Graeme Revell, Alice Cooper, and the London Jazz Percussion Ensemble. 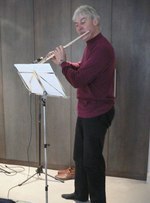 Keith is now mainly involved in solo performances and recordings, chamber and duo ensembles. He is anxious to promote the role of the marimba, vibraphone and multi-percussion instruments in contemporary settings. Keith plays a custom-built DeMorrow marimba and Musser vibraphone. Raymond Burley's solo guitar work is already well recorded and he has performed with many ensembles. His latest collaboration is with percussionist Keith Fairbairn who has worked with major London orchestras including the London Symphony and the London Sinfonietta. He has also worked with John Williams, Mike Oldfield, Dionne Warwick, John Dankworth, Madonna and the London Jazz Percussion Ensemble, and is busy as a first call percussionist. Oxford's Holywell Music Room immediately impresses with the acoustic generated by its high roofed ceiling. A handclap brings around two seconds of reverberation. The hall, paid for by public subscription, was opened in 1748 as the first purpose built concert hall in the world. From the outset it's important to imagine the sheer wall of sound generated by the marimba, covering a massive breadth of timbres and complexity of sound. Ray was using a small amount of sound reinforcement but was clearly audible acoustically and the balance between the instruments was spot on. Keith was hurtling to and fro most of the night behind his marimba (which had been freshly minted in the USA and delivered a few days previously). The opener, Gaspar Sanz's Canarios, saw Ray setting a brisk pace with Keith sitting alongside him on tambourine. Keith's touch was subtle with syncopated sympathetic accents, well controlled yet displaying elements of improvisation. A simple and effective start that was received very well by an audience that increasingly warmed to the performers' unpretentious style. Partie Polonaise by Telemann followed and here the full range of sound from the instruments really kicked into gear with harmonic complexities and central motifs clearly articulated within a sense of purpose and forward movement. The audience appreciation for this was loud and long. In each half Ray and Keith performed solos with Ray producing three classics namely; Gordon Giltrap's The Long Road Home, Falla's Homenaje and Andante from Bach's second violin sonata (BWV 1003). The pieces were performed with focus and sensitivity with a member of the audience clearly moved to tears by the Falla. The Holywell's acoustic is truly supportive to the solo guitar, with every note creating an ambience of the highest quality yet leaving semitones fully accessible in busier passages. Keith's return to the stage saw them launch into Café 1930 by Piazzola and the atmosphere was transformed immediately by their dramatic interpretation of the piece. Bartok's Romanian Dances are cleverly written and sounded quite astounding and whilst musically quirky at times, the duo continued to phrase their parts accurately thus retaining cohesion and left for the interval having created a memorable first set. The second half started with Imagens Do Nordeste by Celso Machado, the Brazilian guitar virtuoso and percussionist, with a piece reflecting the music and countryside of North-East Brazil. Originally for two guitars, the complex rhythms were firmly nailed and Machado's vibrant and in-the-moment writing was a great opener. Following was Poulenc's Suite Française, creating contrast on every level. Bringing out the thread of inspired lunacy that sits within Poulenc's music, it was very listenable and the following Leo Brouwer Micro Piezas were a tour de force. Keith's first solo was Michi by Keiko Abe and was inspirational. The visual effect was mesmerising and the powerful movements of the piece were galvanising. This was a high point in a brilliant concert and Keith richly deserved the extensive appreciation of the audience. The second solo, Nancy by Emmanuel Sejourne, was sensitively played and transported the concert into its finale, Kaleidoscope by Miklós Rózsa, which completed a pleasingly long concert to tumultuous acclaim. The encore was a sweet arrangement of Lennon and McCartney's Penny Lane and was equally well received. The two musicians were in obvious musical rapport throughout the concert and the audience were drawn in effortlessly by the fabulous sound and the brilliant interplay of instruments that are seldom seen and heard together.